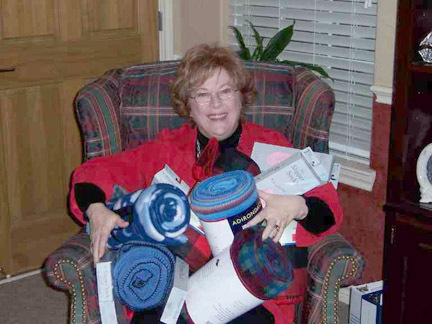 Each year Changing Seasons Home Health warms up for the annual blanket & sock drive. The fall leaves crunch softly as Jan Lehmann, owner of Changing Seasons Home Health, helps deliver armfuls of donated blankets and socks to a local long term care facility. “From what we’ve been told, these are often the only gifts some of these seniors will receive this Christmas. They really make a difference.” says Jan.
Each year, Changing Seasons selects a different long term care facility as the recipient of the donated items. High Tech or Low Tech? At Changing Seasons, we offer the latest high-tech equipment, but sometimes the most comforting things are decidedly low tech- like a cozy blanket, warm socks and companionship! You Can Help! Help make someone’s Christmas a little better by donating a lap blanket, twin size blanket or socks. Call us and we’ll pick them up, or you can drop them off.